Working in an industrial environment, you will notice that dirt and debris quickly builds up on many different surfaces. Whether you’re looking at the inside of a tank or a large area of concrete, it doesn’t take long before the surface is coated in unwanted materials. Until recently, all industrial businesses would have needed to utilise chemicals or time-consuming methods to remove this build up. However, this is no longer the case thanks to hydroblasting. – It does not use harmful chemicals or dangerous substances, which makes it a completely safe technique. This also means there’s no worry of causing damage to the environment or the surrounding areas. – The method is quick and efficient, which cuts down on business downtime. Rather than having to take a lot of time away from tasks to allow for industrial cleaning to take place, hydroblasting can have the job done in record time. – No damage is caused to the surface that is being cleaned, which cannot be said for all other forms of industrial cleaning. This is because, though there’s a lot of pressure used, water is harmless. 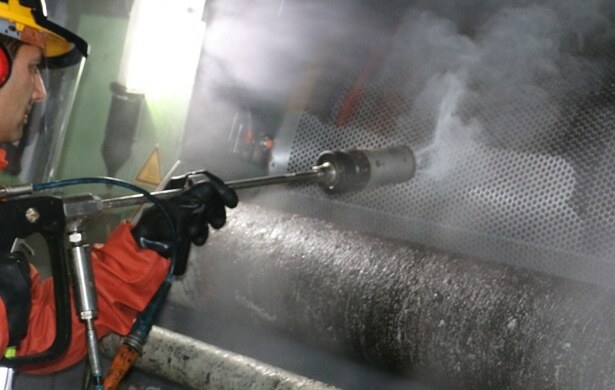 – Hydroblasting is a lot more cost effective than other techniques, simply because it requires less time and less manpower. – No heat is used, which cuts down on the chances of a fire hazard occurring. Additionally, the lack of heat means there’s less chance of equipment and materials being damaged in the process. – Hydroblasting allows us to clean areas which are otherwise hard to reach. By directing the water in an accurate way, it’s possible to clean areas that otherwise go unnoticed. Though there are a number of reasons to choose high pressure water jetting, it’s important that it is carried out by trained professionals. The pressure and speed in which the water travels can cause harm to others, which is why expertise is required. At Mantank, we firmly believe that hydroblasting is one of the best ways to clean industrial equipment. Rather than struggling to remove dirt and debris from an area it can have the job finished in minutes. Through years of experience and a great deal of training, we are able to offer a professional service to all of our customers. Whether you need industrial tank cleaning, industrial cleaning or you want another surface focused on, we are always able to help. Get in touch today to find out more about hydroblasting. Contact the Mantank team on 0161 799 3337 or 01642 618006 and speak to an expert. Alternatively, get in touch online. We’ll get back to you as soon as we can. Next PostNext Why Choose Mantank?